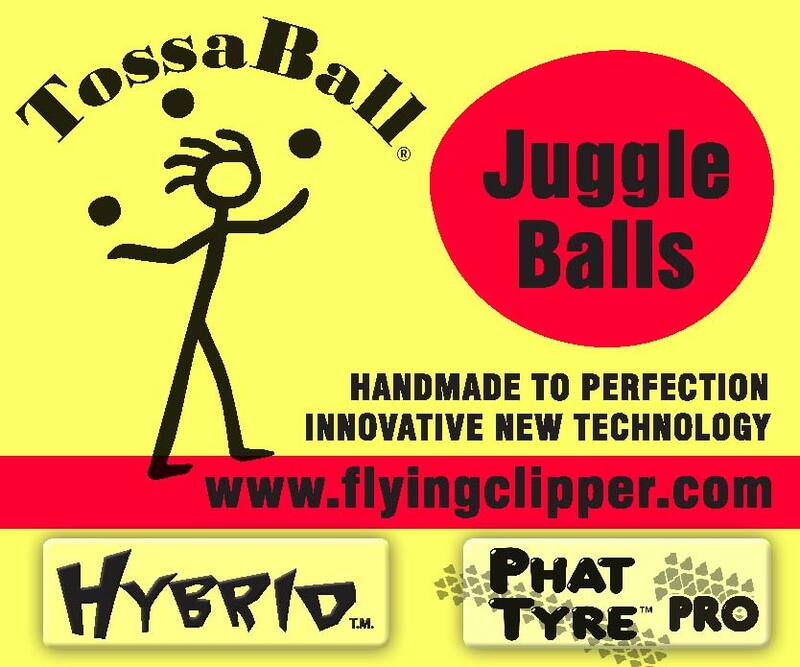 Flying Clipper is home to the durable Dirtbag® footbags and Tossaball® juggling balls that make beginners feel like pros! Just getting started in the world of juggling balls or footbag? Our juggling supplies and footbag videos or books can help you to get a good start! Plus, get into the spirit with our selection of Flying Clipper extras! We take pride in designing and creating the world's leading handmade, high-quality Dirtbag footbags and Tossaball® juggling balls! Largest juggling organization in the world, publishers of Juggle magazine. They put on a good festival every summer and winter as well. Just what the name says, lots and lots of information about juggling... good place to find information about juggling festivals, also complete listing of juggling prop vendors. Kenn Serrano delivers a fully packed show in light of old fashion Vaudeville. Through the fine art of prestidigitation, a comedic twist of the present and a quick wit . Kenn opens the show with laughter and does not stop. From mentalist to highly technical card manipulator Kenn is a master showmen, and captures the essence of magic that will stretch your imagination. You will marvel at the incredibly intricate and exotic balloon sculptures. The dexterity and legerdemain is impeccable as Kenn bewilders even the most cynical of skeptics. The show finales with Kenn mounting a six foot unicycle. Get your flow on with Master's choice of props! Matt has been juggling since 1981 and has won several competitions in Diabolo & Cigar Boxes at the International Juggling Association. A great place to purchase just about anything juggling related. The owner, Ben Shoenberg is fast, friendly, and efficient. Circus Skills: Comedy, juggling, magic, acrobatics and sideshow. You want Solenne (rhymes with go Ben). She's unbeleivablamastic. She Juggles five balls, three flaming torches, contact balls and passes seven clubs. She spins poi, flags, staff, juggling sticks and fire. She hula hoops, does hat tricks, slapstick, balloon animals, clowning and more. She preforms and teaches children of all ages. Available for parties, festivals, schools, private lessons, creative inspiration and playful cacophany. You want Solenne. These are the vendors who set up at our last Juggling Festival! They carry a very large supply of Contact Juggling Balls, Devil Sticks, Diabolos, Yomega, YoYoJam & Duncan Yo-Yo's, LED Balls, Stage Balls, Juggling Clubs, Poi, Contact Staffs, Beanbag Balls and Juggling DVDs and Magic Supplies. Can do: birthdays, night clubs, host/mc, jusggling, fire, glow, special events, festivals, big tops, small tops, any size top, theatres, schools, wandering minstrel, song, dance, online, in space...and magically all over the place! A selection of fire dancing tools, collapsible hoops, Light up LED toys, juggling and various other skill toys.